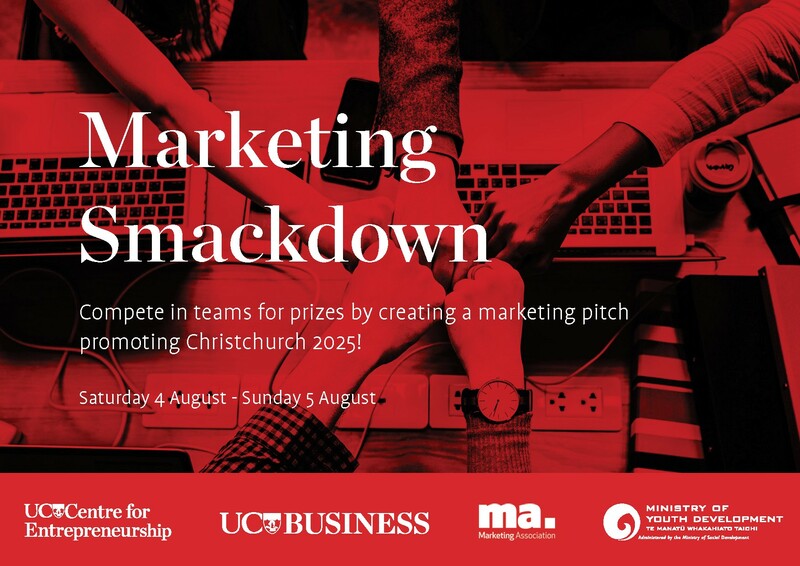 The Marketing Smackdown is a two-day challenge where you will find innovative ways to solve problems that the Christchurch business community is facing. You will get the opportunity to hear inspirational speakers, and work with mentors and experts in the marketing industry, and have the opportunity to win cash prizes. If you’re interested in the power of marketing, this is the event for you! We supply you with all the information and people you need to get the most out of your experience. All you need to do is apply and turn up! All tertiary students are eligible to register, either as a team or as individuals. Registrations close Sunday 29 July, the Challenge is 4 – 5 August with the launch on Thursday 2 August. If you have any questions please contact Hannah Rhodes at hannah.rhodes@canterbury.ac.nz.